Sandra Bullock has starred in numerous films over the years and won the Academy Award for Best Actress in 2010. Loved by many for her “girl-next-door” persona, Sandra has more pressure and spot-light on her now more than ever. Do you think she has had some nips and tucks or is she au natural? Sandra Bullock is Looks Like a Wax Figure! 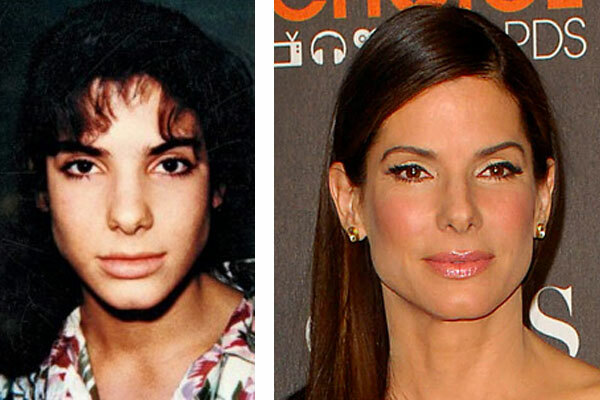 Somebody needs to hold a plastic surgery intervention for Sandra Bullock before it’s to late!!! Poor Sandra’s nose is getting smaller and smaller the bigger her career gets. Upon comparing this before photo of a much younger Sandra we can tell she has had multiple rhinoplasty procedures and her nose is much more narrow and defined. She is also LOVING the effects of botox, because she can’t seem to get enough of it. Recently, at many red carpet events Sandra’s face has been so tight and line free it looks hard for her to even make an expression! In addition to mounds of botox and a shrinking nose, it also looks like Sandra has been using lip injections to plump up her top lip, which actually looks well done. Sometimes makeup can give a plumping effect, be we suspect this is the work of a talented plastic surgeon.